Schaumburg, IL (January 2015) – Productivity of production equipment is the key to profitability. Whether it is a steel mill, paper mill, mine or wind turbine, if it is not running, it is not making money. 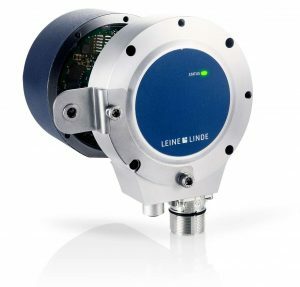 The Leine & Linde model 800 rotary encoder is already a popular solution for measurement of speed and position in these demanding applications, and now an Advanced Diagnostics Upgrade (ADS) Unit is available for this encoder family. The new ADS Online Upgrade Unit can be mounted on encoders in the field bringing significant new capabilities to the operation and maintenance of the equipment. ADS Online provides specific detail on the health of the encoder, enabling proactive maintenance to be performed should it be deemed necessary. Equipment life is affected by a number of operational and environmental factors making each installation unique – for example, the alignment and speed of the motor shaft as well as environmental factors like temperature and vibration affect equipment life. ADS Online monitors a number of parameters that are fundamental for the encoder function such as: output voltage level is correct, output states change correctly, the correct number of pulses are present each revolution, and that the optics performs within defined levels for supply current and brightness. In addition, vibration levels, hours of operation and internal temperature are also measured and logged. The operator can set alarm levels on any of these parameters, as well as set logging intervals for trend evaluation. By monitoring trends in performance, it is possible to predict end-of-life conditions and plan maintenance activities before a failure occurs. For more information on these encoders, contact Bob Setbacken at HEIDENHAIN at 805-562-1160 or write to HEIDENHAIN Corporation, 333 E. State Parkway, Schaumburg, IL 60173.